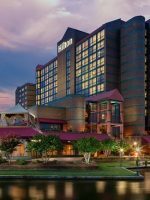 Located approximately 15 minutes north of Charlotte, North Carolina, Great Wolf Lodge Concord welcomes families to relax in rustic elegance. Think of it as retreating to your own woodland lodge, only its attached to an indoor water park. 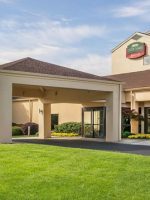 In fact, this non-smoking hotel has everything a family would need for a vacation, family reunion or even just a quick weekend getaway. From spacious accommodations that sleep up to eight to the numerous attractions and activities — not to mention the many choices for onsite dining — Great Wolf Lodge leaves nothing to chance when it comes to providing an unforgettable experience for the entire family. Have racing fans in the family? 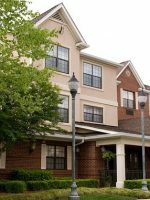 Then you’ll love the hotel’s convenient location to Charlotte Motor Speedway and zMAX Dragway, both of which are just 4 miles away. Many of the most popular race shops are also within 30 minutes of the hotel, and the NASCAR Hall of Fame is just 20 minutes away in Charlotte. And when you’ve fulfilled your need for speed, you can return to Great Wolf Lodge Concord to relax and splash the day away. 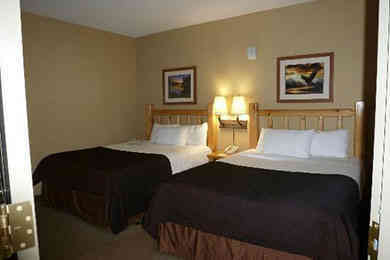 All guestrooms contain refrigerators, microwaves, coffeemakers, flat-panel TVs and free Wi-Fi. Complimentary Pack n' Play cribs are available for free on a first-come, first-served basis, so be sure to reserve when booking reservations. 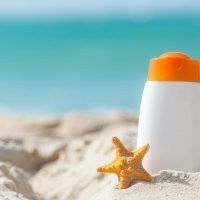 In addition to regular amenities of conditioning shampoo, lotion and soap, you'll also find Scooops Kids Body Wash. All rooms also include water park passes for each guest. Accommodating up to six guests, this room includes two queen beds, a nightstand, dresser, desk with chair, full-size sleeper sofa, coffee table, side table and bathroom with tub/shower combo. The refrigerator, microwave and coffeemaker are set up on a bar near the room entrance. The beds and sitting area are separated by a partial wall, giving some privacy for each area. Many rooms also include a private balcony or patio. For up to four guests, this ADA-accessible guestroom features one queen bed, two nightstands, a full-size sleeper sofa, a coffee table, a dresser, a table with chairs, a full bathroom with bathtub with grab bars or roll-in shower, and a private balcony or patio. With sleeping accommodations for up to four guests, this guestroom includes a king bed, two nightstands, dresser, table with chairs, full-size sleeper sofa, coffee table, full bath, and private balcony or patio. Available for a maximum of four guests, this guest room comes with a king bed, two nightstands, a dresser, table with chairs, a full-size sleeper sofa, an in-suite whirlpool tub, and a private patio. Sleeping up to six guests, the majority of this guestroom is traditional, with a queen bed, nightstand, full-size sleeper sofa, coffee table, dresser, desk, chairs, private balcony or patio, and a full bathroom with tub/shower combo. However, it also features the Wolf Den, a cave-themed sleeping area with bunk beds and a TV. This room type also features ADA-accessible variations. Available for up to five guests, this suite actually contains a cabin-themed "room" for the kids that contains a set of bunk beds, a daybed and a TV. In the remainder of the guestroom, you'll find a king bed, two nightstands, a dresser, and table with chairs. This room type also features ADA-accessible variations. Take the kids camping while mom and dad enjoy all the comforts of a cozy hotel in this room that accommodates up to four guests. Inside the room, there is a "tent" outfitted with bunk beds and a TV. In the remainder of the room, there's a queen bed, a nightstand, a full-size sleeper sofa, coffee table, table with chairs, and a dresser. The refrigerator, microwave and coffeemaker are set up on a bar near the room entrance. This room type features ADA-accessible variations. This two-room, ADA-accessible guestroom for up to six guests includes a master bedroom with a king bed, two nightstands, a dresser and chairs. In the main room, there is a queen bed, a nightstand, a full-size sleeper sofa, a dresser, table with chairs, a full bathroom with tub/shower combo, and private balcony or patio. In this two-room suite, up to six guests can relax in the master bedroom with its queen bed, TV and full bath, or the main room with two queen beds, a nightstand, dresser, sofa, table and chairs, and private balcony or patio. There's even a second full bathroom. Designed for up to eight guests, this suite includes a master bedroom with a king bed, nightstand, dresser and TV. The main room contains two queen beds, a nightstand, a full-size sleeper sofa, coffee table, chair, dresser, TV, and a breakfast bar area with seating for six. This ADA-accessible guestroom features a master bedroom with a queen bed, a nightstand, TV and full bath, while the main room has a queen bed, nightstand, dresser, TV, full-size sleeper sofa, table and chairs, and second full bathroom. Some suites also include a private balcony or patio. Available for up to eight guests, this room includes a master bedroom with a queen bed, a nightstand, dresser, TV and full bathroom. The main room has two queen beds, a nightstand, full-size sleeper sofa, coffee table, dresser, TV, table and chairs, corner fireplace, second full bathroom, and private balcony or patio. The only two-bedroom guestroom, this suite features a master bedroom with a king bed, nightstand, dresser, TV and full bathroom. In the second bedroom, you'll find two queen beds, a nightstand, dresser and TV. The living area includes a full-size sleeper sofa, coffee table, side table, two chairs, table and chairs, dresser, TV, private balcony or patio, and a second full bathroom. This was my second trip with my grandson (first time was a couple of years ago). He thoroughly enjoyed the quest adventures, the water park, and the arcade. The staff were exceptionally helpful. I had asked for a room away from the main activities both visits and each time the location has been great. The only negative for us was that the food choices are not great - the prices are at a resort level but the food is not. Absolutely great for kids! I have 6 year old twins they loved it. I would reccomend going for more than a day, lots of activities. Clean rooms. Extremely busy but it is spring break . Easy check in. Food was good, pricey as to be expected. Waterpark was great. I enjoyed the slides myself. Overall trip was awesome. Water park access is exclusive to guests of Great Wolf Lodge and is available from 1 p.m. on the day of arrival until the water park closes on the day of departure. Hours of operation for the water park are usually 9 a.m. to 9 p.m., but are subject to change based on occupancy. Towel service is provided, and lockers, bathrooms and changing areas with shower facilities are available. Lifeguards are on duty throughout the water park during water park hours. Life jackets are available for use and are highly recommended for all children 48 inches and shorter, and for those who are weak or non-swimmers. All children ages 12 and younger require adult supervision. The water park maintains 84 degrees Fahrenheit year-round. This multi-level treehouse includes more than 40 water features, including a 1,000-gallon water bucket that dumps water every three to five minutes on bystanders below. There's no age or height limit for this attraction. The indoor water park includes a variety of waterslides that range in thrills and excitement. Both Howlin' Tornado and River Run Canyon are family slides with rafts that will accommodate up to four people. Alberta Falls takes riders down on a single or double tube, while Totem Towers are a group of waterslides descending from Fort Mackenzie. Grab a mat, and get set to race your friends and family down the four lanes of the Mountain Edge Raceway. Kids 48 inches and shorter can enjoy their own waterslides in Whooping Hollow. Height and age limits vary by attraction, so check posted requirements at the entrance of each slide. Prepare to catch a wave on the zero-entry wave pool that dominates the indoor water park. Wave action generally lasts five minutes a session, with calm waters in between intervals. Toddlers will love the splash fountains and water curtain located in one corner of the zero-entry entrance to the pool. Maximum water depth is 5 feet. Test your balance as you walk across logs and lily pads in this 4-foot-deep pool. Want an extra challenge? Try to raise a friend side by side on the courses. Strike up a game of water basketball in this large swimming pool. Maximum water depth is 4 feet. Children less than 48 inches tall must be accompanied by an adult, wear a life jacket or pass a swim test. For the toddlers, this splash area includes miniature waterslides, stationary jet skis, water sprayers and cannons, and dumping buckets. Maximum water depth is 18 inches. Maximum height is 54 inches. For more privacy in the water park, consider a cabana rental. These private "tents" enclose your private space that contains a table and chairs for four, shelving for your towels, flip flops and beach bags, a mini-refrigerator stocked with non-alcoholic beverages, Great Wolf Lodge playing cards, a flat-screen TV, and a complimentary copy of USA Today. 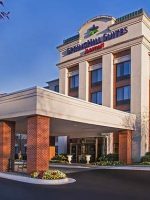 Check with the hotel for current rates and availability. Open Memorial Day through Labor Day (hours vary throughout the season), the zero-entry heated swimming pool features water geysers and curtains at the entrance and water basketball goals at the opposite end, which reaches a depth of 4 feet, 6 inches. There's also a large tower that periodically rains down a flood of water. Tables, some with umbrellas and chairs, as well as loungers, are spread around the pool area. 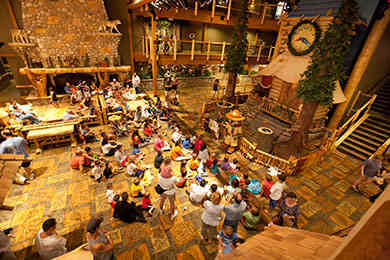 MagiQuest is Great Wolf Lodge's exclusive live-action, interactive game that takes place throughout the lodge. Many of the MagiQuest "elements" are located in the hallways between the lobby and the guestrooms, so it can get a bit crowded making your way through the hall when a lot of children are actively playing the game. There are two add-ons to MagiQuest: ShadowQuest and CompassQuest, which include new challenges. This attraction requires a fee. Take the fun at Great Wolf Lodge to new heights on this 50-foot-high ropes course that includes four levels filled with such challenges as rope bridges, tightrope crossings and balance beams. There's even a smaller course for younger children. Note: Close-toed shoes are required for this activity. You must be 48 inches tall or accompanied by a responsible adult. This attraction requires a fee. Tee up for 12 holes of miniature golf surrounded by sand traps, life-like animals and golf ball-eating fish. This attraction requires a fee. This game room contains more than 100 games ranging from skeeball and air hockey to the most intense racing games. Hours of operation are 8 a.m. to 11 p.m. Sunday to Thursday and 8 a.m. to midnight Friday and Saturday. Guests purchase a Paw Points card and load with points to activate games. Cards can be reloaded. Guests earn tickets at each game, which can be redeemed for prizes. Go inside a live-action, LED arcade-style game as you and your family race the clock to rack up as many points as possible by chasing quick-change laser lights. This attraction requires a fee. Challenge your family and friends to see who can hit the most moving targets in this high-tech, 4-D interactive adventure. This attraction requires a fee. Guests of all ages can test their skills on this pint-sized bowling alley. Features include half-length lanes, built-in bumpers, 5-pound balls and the ability to wear your own shoes. This attraction requires a fee. Immerse yourself in this 4-D theater that will put you right in the action with a full-motion theater seat. This attraction requires a fee. Open daily from 10 a.m. to 5 p.m., this spa, targeted to kids ages 6 to 12, features ice cream-themed manicures and pedicures served up in banana split-style seating. The spa menu includes an ice cream manicure ($44.99), ice cream pedicure ($49.99), a mani/pedi combo ($74.99), a Mommy & Me Pedicure ($79.99), a Chocolate Covered Organic Facial ($39.99) and a Neapolitan Combo -- manicure, pedicure and facial ($94.99). Nail toppings are available for $2 per nail or $15 for 10. Kids also can get "Sprinkled in Scooops," a quick treat featuring a take-home tiara and sash, a signature ice cream-flavored lotion sampling, hair scent, and lip gloss application ($9.99). All services include a free scoop of ice cream. Prices do not include taxes or the recommended 20-percent gratuity. Reservations are recommended. Appointments cancelled within 24 hours incur a $25 cancellation fee per service. To maintain polish, guests are encouraged to book their services after enjoying the water park. Take time to relax and unwind at this full-service spa, where you can choose from massage therapy, skin therapy, nails and waxing services. Teens ages 13 to 18 also can choose to have a massage, facial, manicure, pedicure or a combination of all four services. Make your own stuffed animal souvenir, choosing from one of the Great Wolf Lodge characters or selecting your favorite animal. Prices vary by animal and outfit. This free activity takes place daily at 9 a.m. in the lobby, where guests go on a "nature" hike, learning about wildlife and how to do the Great Wolf Lodge howl. This musical show takes place in the lobby three times each day: 10 a.m., 8 p.m. and 9 p.m.
Join Great Wolf Lodge characters Wiley, Violet, Brenley and Oliver each night at 8 p.m. to hear a great bedtime story. This kids' activity space is the place for arts, crafts, games and more. Some activities, such as painting ceramics or Color-Your-Own T-shirt incur a fee. Geared to children 12 and younger, the Cub Club generally is open from 10 a.m. to 7 p.m. daily, although hours vary by season. Note: This is not a drop-off children's program; parents are required to be with all children ages 12 and younger. Let your kids become a part of the action at Great Wolf Lodge as a member of the Clubhouse Crew. Your child will partner with their own Great Wolf Kids character and join others in an interactive adventure. This attraction requires a fee. The hotel offers a variety of free kids activities, such as face painting and making character face masks throughout the day in the lobby. A current schedule of activities is available daily at the front desk. During October, Great Wolf Lodge Concord celebrates Halloween with a number of family activities including a Trick-or-Treat Trail, Monster Bash Dance Party, Spooktacular Story Time, Costume Parade and the Howl-O-Ween House. Special packages are available. For the holiday season, Great Wolf Lodge Concord turns into a winter wonderland with snowy decorations, North Pole University activities, a life-sized gingerbread house, Santa's letter-writing depot, and even themed guest suites outfitted with holiday dÃ©cor, a Snowland throw and a special storybook. Special packages are available. Note: For all restaurants, hours are subject to change based on occupancy. This onsite restaurant is open from 6:30 a.m. to 9 p.m., and features a full menu of doughnuts, bagels, breakfast sandwiches, a coffee menu and beverages. To avoid the morning rush, grab your doughnuts the night before so you can sleep in and eat breakfast when ready. Open from 11 a.m. to 10 p.m., this full-service restaurant serves lunch and dinner, as well as full bar service. Lunch and dinner items include appetizers, entrÃ©e salads, burgers, soups, sandwiches, pastas and entrees like Lodge Smoked Ribs, Backyard BBQ Platter and Char-Grilled Chicken. The restaurant also has a kids' menu that includes staples like chicken tenders, grilled cheese and burgers. The culinary staff is prepared to accommodate any special dietary needs or requests for allergen-free alternatives, as well. Open for breakfast from 8 to 11 a.m. and serving dinner from 5 to 9 p.m., this dining spot offers a variety of choices on its extensive buffet. Breakfast offerings include waffles, breakfast meats, cereal and fresh fruit, while dinner items include a salad bar and carving station. Available for take-out from 10 a.m. to 10 p.m., this eatery's menu selections include pizza, pastas, salads, garlic cheese bread, and Italian and meatball sub sandwiches. To avoid a wait, you can call and place your order for pick-up. Located inside the water park, Buckets features lunch favorites like hot dogs, chicken tenders, burgers and salads, along with sides such as fries and mac and cheese. You also can choose a snack like hummus with pita bread, tortilla chips with salsa or cut fruit with yogurt dip. For the whole family, order up The Tipping Bucket, an ice cream treat with layers of ice cream, cookies, brownies and candy, topped with chocolate sauce and whipped cream. Satisfy your sweet tooth from 10 a.m. to 10 p.m. with your favorite flavors of fudge, fresh-baked pastries, ice cream or fresh fruit. There's also a full menu of specialty coffees. 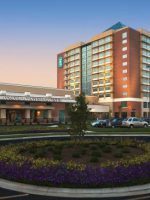 Great Wolf Lodge Concord charges a daily resort fee of $19.99 to cover expenses such as Wi-Fi, parking, the fitness center, pool towels and a complimentary copy of USA Today at the front desk each day. All children visiting Great Wolf Lodge Sandusky receive a pair of "wolf ears" at check-in. If your child has a birthday during your stay, notify the staff when making reservations or checking in, and your child will receive a special pair of birthday "wolf ears." The birthday child also will receive a special wristband that entitles him or her to complimentary ice cream at Bear Paw Sweets & Eats -- one scoop per visit -- throughout your stay. Great Wolf Lodge Concord features several boutiques where you can choose the perfect souvenir or pick up a forgotten essential. Shopping options include Buckhorn Exchange Gift Shop, Bear Essentials Swim Shop, MagiQuest Marketplace, The Great Wolf Kids Store, The Name Shop and 3D Paw Prints. The hotel offers a full-service spa with massages (including a maternity massage), facials, waxing, manicures and pedicures. There's also a separate menu of teen services for ages 13 to 18. A 20-percent gratuity is recommended. This 24-hour fitness center will keep your exercise routine on track with free weights and a selection of cardio equipment like a stationary bike, ellipticals and a treadmill. Towel service is also provided. These passes package together several kids' activities at savings of up to 30 percent over individual pricing. For $69.99, the Paw Pass is geared to kids ages 6 and older, and includes the following: one MagiQuest or ShadowQuest game; choice of one CompassQuest game, classic or color wand, standard topper or Magi belt; one animal at Creation Station; one Clubhouse Crew Adventure game; one 12-ounce Mike and Ike candy cup; one Leather Treaty bracelet; one 6x8 3D Paw Prints photo and frame; one climb at Howlers Peak Ropes Course; and a $5 Paw Points Card for the Northern Lights Arcade. For $44.99, the Pup Pass is geared to kids ages 5 and younger, and includes the following: one Color-Your-Own T-shirt or pillowcase; one animal at Creation Station; one Clubhouse Crew Adventure game; one 12-ounce Mike and Ike candy cup; a $5 Paw Points Card for the Northern Lights Arcade; and a single scoop of ice cream. For $99.99, the Wolf Pass includes one MagiQuest or ShadowQuest game; one CompassQuest game; choice of classic or color wand, standard topper or Magi belt; one animal at Creation Station; one 12-ounce Mike and Ike candy cup; one pair of swim goggles; one Glitz Glitter tattoo; one 6x8 3D Paw Prints photo and frame; one Leather Treaty bracelet; $5 Paw Points Card for Northern Lights Arcade; one round at Howl in One Mini Golf; one ride at Howly Wood XD Theater; one game at 4D World; one game at Ten Paw Alley; one game at AtomicRUSH; and one climb at Howlers Peak Ropes Course. Although check-in doesn't start until 4 p.m., visitors to Great Wolf Lodge Concord can arrive as early as 1 p.m. to pick up their water park passes. Check-out is by 11 a.m., but guests can stay and enjoy the water park until it closes. Great Wolf Lodge Concord stays busy in the summer and during all school holidays: spring break, winter break, Thanksgiving, Christmas and New Year's. Therefore, to avoid crowds, book your trip around these times. To get the best rates, book as far in advance as possible, because you save more if you book at least 30 days out. 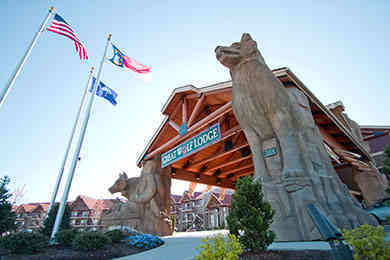 Great Wolf Lodge Concord honors a number of discounts including AAA, military, police, fire, and EMT, and AARP. The hotel regularly offers special packages and discounts, too. 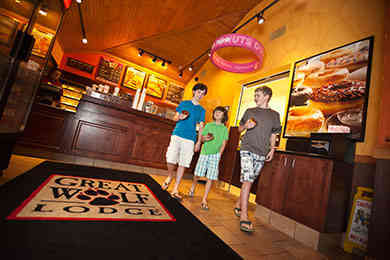 Great Wolf Lodge Concord is 20 miles from Charlotte Douglas International Airport. Although the hotel doesn't provide shuttle service, there are numerous transportation services that do. When traveling by car, take Interstate 85 to Exit 49; exit onto Bruton Smith Boulevard and head east. Go approximately .2 miles and turn right onto Weddington Road. Go .4 miles and turn left into the hotel parking lot. The best way to travel around town from the hotel is by car. Parents who have the chance to spend some alone time together can enjoy a massage at Elements Spa Salon before heading to Lodge Wood Fired Grill for a cocktail and quiet dinner.